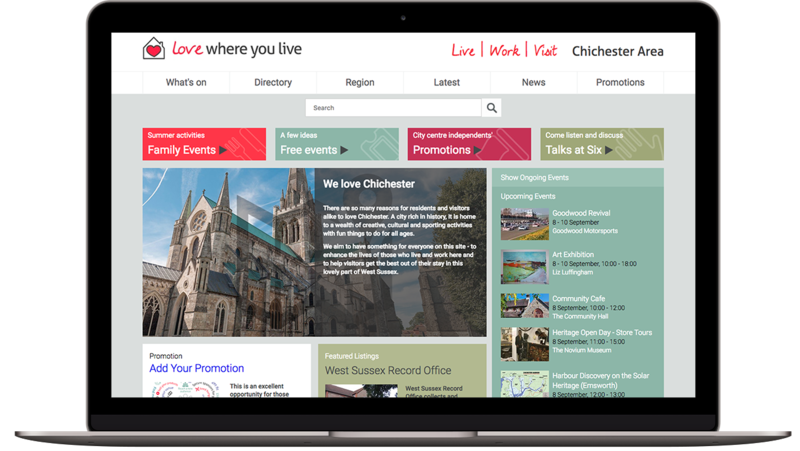 Love Where You Live is a web resource for Chichester City centre and the surrounding area, covering all areas of activity – businesses, charities, clubs, associations and individual freelancers. Your business listing can be edited at any time and is comprehensive, including descriptive text, slideshow of images, contact form, website and social media links, a map to your location as well your events and news items – a true microsite with its own URL. Add your organisations own events for them to appear in our Calendar. Add your promotions to our new Promotions area to encourage footfall to your door. Add news and press releases to appear in our News section. Regular newsletters sent out with participants promotions and events.